We express our outrage at the arbitrary arrests of Turkey’s opposition Peoples’ Democratic Party (HDP) co-leaders Selahattin Demirtas and Figen Yuksekdag, and its 10 MPs on November 4, 2016. With the charges of treason and association with terrorism, HDP MPs are the latest victims of President Recep Tayyip Erdogan and his ruling Justice and Development Party’s (AKP) dictatorial purge, following an attempted coup in July. Their homes have been broken into and their offices ransacked, access to social media and sharing websites such as Facebook and Twitter have been blocked throughout Turkey following the arrests. All 59 HDP MPs have been threatened with prosecution, including Armenian MP Garo Paylan, signaling that the number of party members arbitrarily detained is bound to increase. ‘We are living in 1915—Today is April 24,’ said Mr. Paylan in reference to the Armenian Genocide, through a Tweet released shortly after the arrests. His tweet implies the current actions taken by Erdogan are reminiscent of the evening Ottoman authorities in Constantinople rounded up Armenian elected parliamentarians and leaders at the beginning of the Armenian Genocide. Erdogan is waging an unprecedented purge in Turkey firing over 100,000 employees, and imprisoning thousands of HDP members, executives, mayors, and city council members associated directly or indirectly with the HDP. Just last week, a prosecutor accused Mrs. Gultan Kisanak, Diyarbakir’s first female mayor and a former parliamentarian, and her co-mayor Mr. Firat Anli, of terrorism. HDP lawmakers have issued a joint statement objecting to Erdogan’s inquisition and its legitimacy. Erdogan began singling out HDP leadership after AKP lost its parliamentary majority in the 2015 elections and HDP rejected Erdogan’s desires for a powerful presidential system. The arrests aim to destroy the very foundation of the HDP, as the AKP is afraid of future electoral victories, and ethnic and religious representations of minorities including Kurds and Armenians in Turkey. We will see more arrests and the imprisonment of democrats and progressive individuals in Kurdish areas and throughout Turkey unless serious action is taken. Legally, elected officials and thousands of people imprisoned in Turkey deserve the legal protection of international law against what appears to be only the tip of an iceberg of repression. Continuing military, economic, and political support for the AKP is antithetical to the precarious state and interests of ethnic and religious minorities and Turkish society. Therefore we echo and affirm the call to divest from Turkey started by the Armenian Youth Federation and Armenian students, particularly targeting the University of California and California state’s combined $600 million in Turkish investments. We further call on all institutions and organizations to divest any and all funds from the Republic of Turkey. We call on your good will to denounce the Turkish state’s boundless defiance of all international laws and to put an end to the war on the Kurdish people and other minorities by taking action. Send emails to your elected officials, tell a friend, and attend the nearest protest in your city. 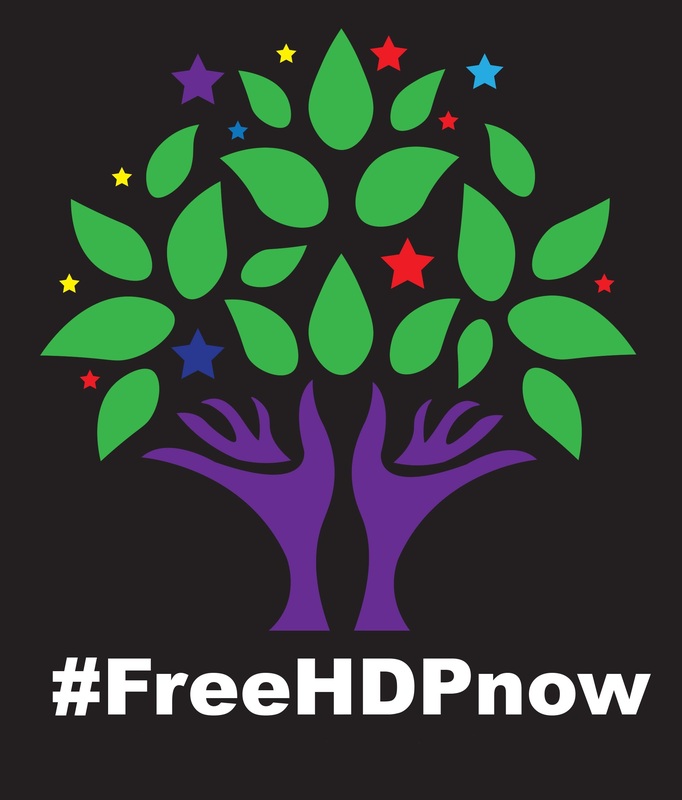 We the undersigned organizations stand in solidarity with HDP and salute their resilience against the political nightmare that is plaguing Turkey, and call on all people of good faith, governments, humanitarian organizations, media organizations, to do all in their power, including the power of office, to seek the unconditional release of HDP parliamentarians, mayors, political prisoners, journalists, academics, intellectuals, authors, and editors who have been imprisoned for defending fundamental freedoms and human rights against the tyranny of the Turkish state.